Are you open-minded enough to entertain a thought without accepting it? What if the thought has merit? 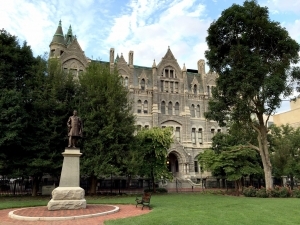 Would you consider changing a deeply-held conviction? Or is it impossible to change your mind on certain issues no matter what?! Anyone who knows me knows that I’m an INTJ. Learning my personality type back in 2013 was one of the most liberating experiences of my life! Without delving into a diatribe declaring the importance of understanding your personality, I want to share ONE aspect of mine about which I am particularly proud: My beliefs run deep, and I am not easily swayed. I love learning, and I truly enjoy exploring issues from all sides (which can be annoying for people who don’t like answering all my questions). And, truth be told, even after intense debate and scrutiny of various positions, I rarely change my opinion mainly because it took a lot of time and consideration for me to arrive at it in the first place. However, when I am presented with logical arguments based on facts that run contrary to my convictions, I am willing to re-evaluate and update my views when necessary. I’ll be the first to admit that it doesn’t happen very often, but it happened recently, and I’d like to share my journey with you. 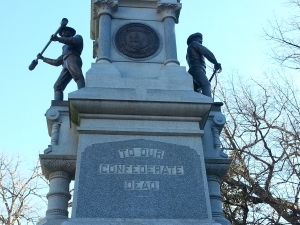 The purpose of this article is primarily to help conservative white evangelicals think through a biblical response to the possible removal of Confederate monuments across the United States. Study it. Grasp it. Teach it. Learn from it. Make it. Archaeology and history are two of my favorite subjects. I have a deep appreciation of the past and a passion for historical preservation. 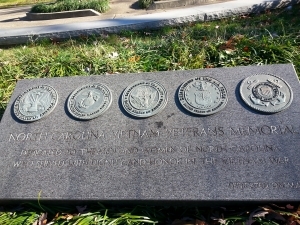 Over the past few years, my family has been blessed to visit many of the monuments and memorials in Washington D.C.; Mount Rushmore in Keystone, South Dakota (or as OnStar called it, “Moun Trushmore”); the Gateway Arch in St. Louis, Missouri; the Veterans Memorial Park in Tuscaloosa, Alabama; and the beautiful West Virginia Veterans Memorial in Charleston. 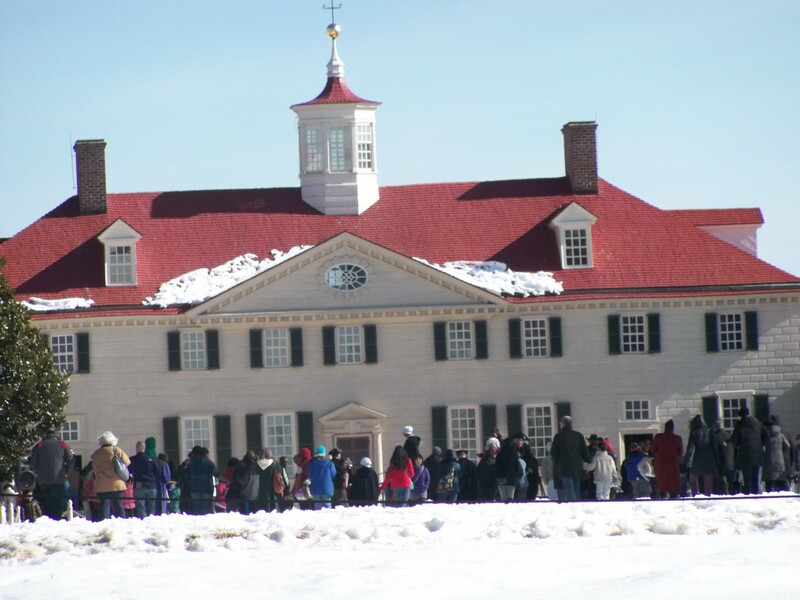 We’ve visited George Washington’s home at Mt. 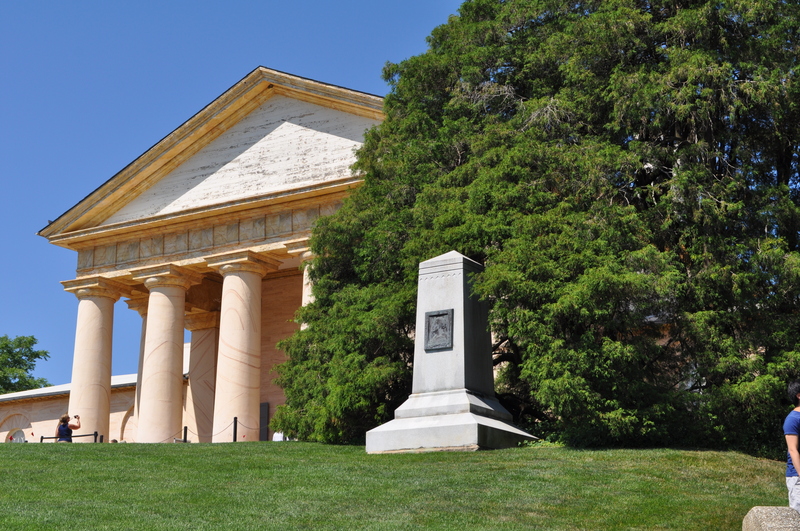 Vernon, Thomas Jefferson’s home at Monticello, and the Arlington House/Robert E. Lee Memorial at Arlington National Cemetery. In the summer of 2016, we drove from California to North Carolina through the middle of the United States on Highways 50 & 70. 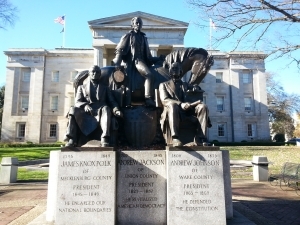 This was our first time on that particular route, and within the course of a week, we were able to visit seven national parks, six state capitols, and one historical building that witnessed the beginning of the end of slavery in this country. 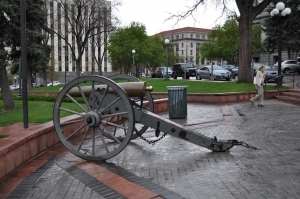 Every state capitol we visited featured some type of war memorial with authentic, battle-worn cannons, long guns, sculptures, statues, and/or monuments—each one created to honor those who lost their lives fighting for our freedom. 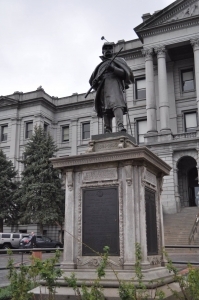 And nearly every state capitol we visited had some type of memorial of the Civil War—even Denver, Colorado! While driving through Kansas, in between two major storm systems (That was fun! Not! 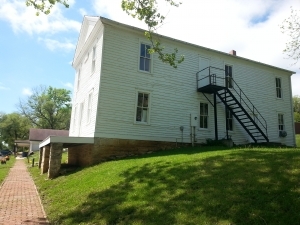 ), we unexpectedly stumbled upon a town I had not previously heard of: Lecompton, Kansas. It’s branded as “The Birthplace of the Civil War,” and since we were in the middle of studying the Civil War, we decided to stop and check it out. 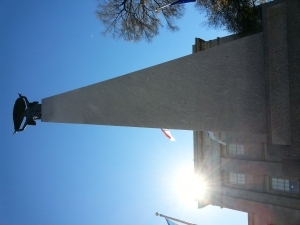 And much to our benefit, we arrived on a local history day. 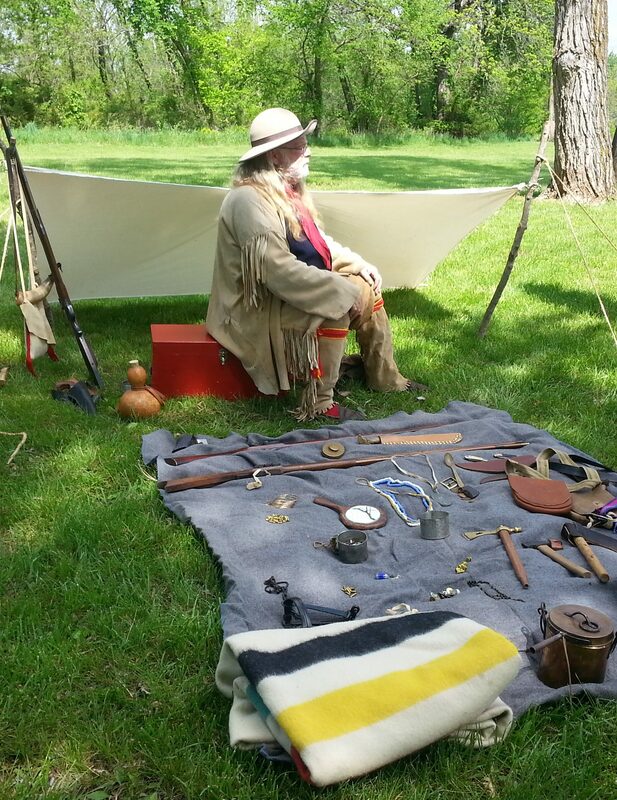 Middle-school children from neighboring communities enjoyed a dramatic presentation at the theater, a visit to the local museum, a dramatic recitation of an important speech, and a visit with a 19th-century trader at his trading post. 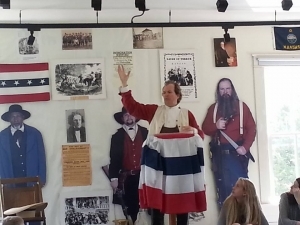 We were invited to participate in all activities, and we sat in on the re-enactment of an anti-slavery speech which was given in the exact same 160-year-old building where it had been given in the 1800s! It was inside this building, Constitution Hall, that a pro-slavery constitution was drafted and rejected—affecting the upcoming election and igniting what would eventually explode into the Civil War. That trip across the country was both beautiful and educational, but it was good to be home. 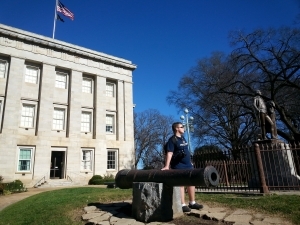 We live in North Carolina, and our own state capitol building in Raleigh is surrounded by memorials to at least six wars. Here are some of the photos we took a couple years ago when we walked around Union Square. 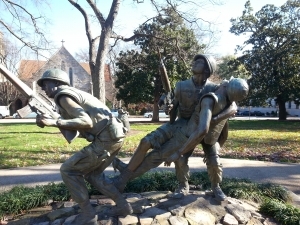 The craftsmanship on these statues is truly breathtaking—especially the detail of the Vietnam Veterans Memorial. When I hear the arguments for and against removal of certain memorials, I take them seriously because I’ve stopped. I’ve learned. I’ve listened. I’ve touched. I’ve photographed. I’ve remembered. I’ve held my breath in gratitude. However, I have come to believe that while monuments and memorials are powerful reminders of our shared history, our shared future is more important. In 2015 when a young white supremacist killed nine African American men and women at a church in Charleston, South Carolina, the cry for the removal of Confederate symbols hit an all-time high. 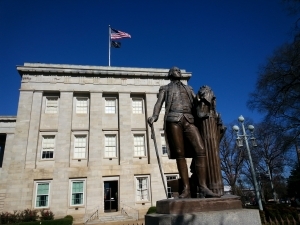 It began with a debate over flying the Confederate flag on state property, and it soon spiraled out to include the removal of Confederate monuments. I was wholeheartedly against that decision. 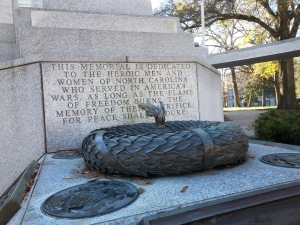 The statues are preserving our history and honoring those who fought in the War between the States. Removing them is like erasing history, and I’m against that. We need to learn from our mistakes, and showing our kids historical monuments is memorable and important. Besides, they honor real people who lost their lives fighting for what they believed in, and their sacrifice deserves to be honored. This rationale is based on three wobbly pillars: outdated information, “white-titlement,” and idolatry. In ancient times, an enemy could influence the historical record simply by defacing monuments (e.g., the Sphinx) or destroying documents and artifacts (e.g., the library at Alexandria). As Winston Churchill so profoundly remarked: “History is written by the victors.” Well, that was then. This is now. The point is this: We live, eat, and breathe in the twenty-first century. 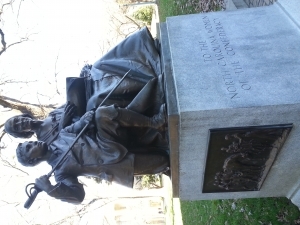 To think that relocating a few hundred statues and memorials will somehow change the historical record is pure nonsense. Removing monuments from the public square will no more erase history than removing Nixon from the White House erased Watergate or removing Donald Trump’s Twitter account will erase his tweets. Thanks to advanced technology, high-speed internet, and physical storage of data, preserving information has never been easier. Add to this the wide availability of access to audio and video recording devices and software, erasing history or modifying it for personal gain has become—for all intents and purposes—impossible. In other words, crowd-sourced history is here to stay, and it is instantly accessible 24/7/365 from your smart watch. You are an African American citizen of the United States of America, and though you were born and raised here, there is slavery in your family tree. Your great, great grandparents were kidnapped from their homes/friends/family/culture, transported in horrific conditions across the ocean, and then sold to the highest bidder for a lifetime of servitude. They lost everything while being denied any opportunity for gain. 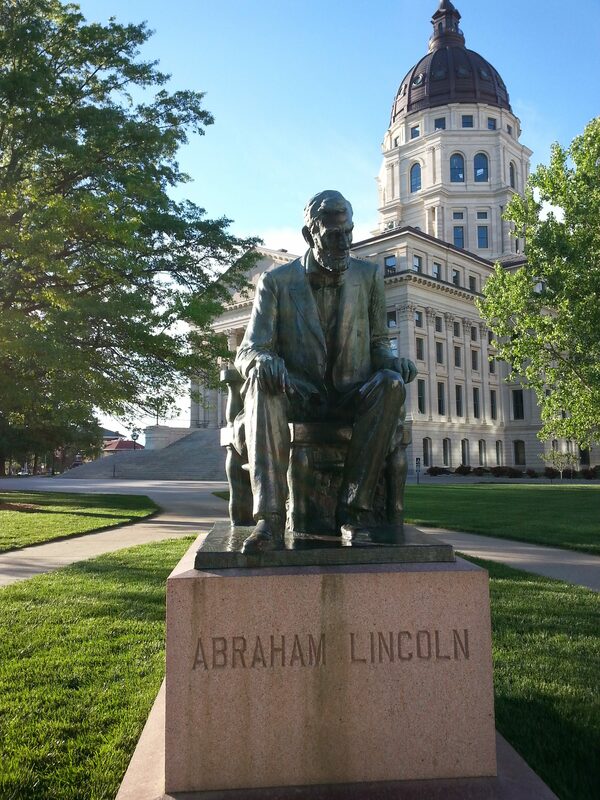 Many years later, when some lobbied to abolish slavery, others fought against it. And when you see monuments on public display honoring those who fought to defend the right to own slaves—whether they owned slaves or not—is worse than pouring lemon juice on a paper cut. It’s a constant reminder that your origins in this country began with kidnapping, humiliation, and enslavement and that some of your fellow citizens will never accept you as equals. When it all comes down, there is no way a white person can experience a Confederate monument the same way an African American person does: It’s impossible. Our recent ancestors were not enslaved! I hope so, because at this point, all I’ve done is stir the pot, right? My arguments are probably less than convincing, and you’d like to counter each observation—plus make a few more points of your own which I haven’t addressed. You want me to do some research so that I understand the “real” cause of the Civil War and how it was about taxes and other issues. 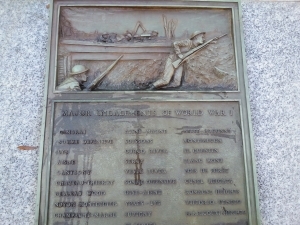 You want me to appreciate the fact that these were real people who gave their lives, and believe they should be honored for their sacrifice. You want to point out that Yankees also owned slaves, and that slavery was not the main reason for the War. Oh, wait, I already said that. You want to point out that tearing down statues is anarchy, and we cannot acquiesce to mob rule. Destroying monuments is a crime and they should be punished. So, we should leave the monuments there to prove a point. What if I told you that NONE of what I’ve written so far addresses the root cause of this emotionally-charged, extremely divisive dilemma? What if I told you that as FOLLOWERS of JESUS CHRIST, we should have NO issue with the removal of Confederate statues, memorials, or monuments? What if I told you that UNDERNEATH the rhetoric and racism lurks a different, more SINISTER problem as old as the world itself? The problem is idolatry, plain and simple. It’s the third wobbly pillar and the most damning of all: idolatry. 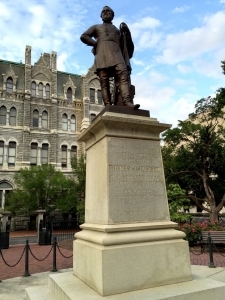 Although no one believes the statue of Stonewall Jackson is representative of a god, and nobody was worshiping the Robert E. Lee statue prior to the events in Charlottesville, idolatry exists just the same. According to Merriam-Webster, idolatry is “immoderate attachment or devotion to something,” and Random House defines it as “excessive or blind adoration, reverence, devotion, etc.” Just let that sink in for a moment. 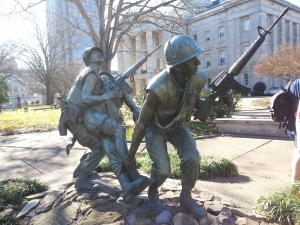 There’s no denying the fact that there exists “immoderate attachment and devotion” to our Confederate memorials—even among Christians—and this “excessive reverence” for works of bronze, metal, clay, and stone is, in fact, idolatry. The fruit of idolatry is conflict, pride, self-reliance, and division—all undeniable qualities of this monumental conflict. Do not be deceived: The fight over monuments is nothing more than one of satan’s tactics to divide and conquer. As long as our eyes are fixed on each other and not on the Lord, we risk turning people away from hope and salvation that can only be found in Him. What are we, as Christians, to be known for? Are we willing to sacrifice our own handiwork for the sake of unity and peace? Are we willing to step out of our comfort zones in order to reach those who otherwise might not be reached? Have we placed the love of things above the love of people? 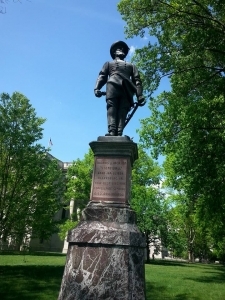 If I knew that my attitude against removing Confederate monuments was a stumbling block to another person’s coming to know the Lord, would I be willing to stand down? Is preservation of a temporal monument more important than an eternal soul? Is the adversary using my words and/or actions to make another person feel oppressed, unheard, and hostile to the gospel message? Is my heart being hardened towards protesters? People of color? Liberals? What does Scripture say about this type of conflict? Based on what I know about Jesus, how do I think He would respond to this crisis? And, finally, how would He have me respond to the crisis? To my neighbor? To those seeking light in a dark world? 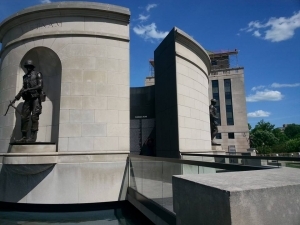 After much consideration, I have come to agree that monuments honoring soldiers who fought for the Confederacy should be moved to museums or venues specifically designed to educate people about the Civil War. There really is no need to have them in the public square. It’s time to move on. Very well written. It’s interesting, I’ve gone through a very similar progression of thought on this. I was also originally against the removal of the monuments for the same reasons you mentioned. But when I saw how much those monuments meant to the KKK, I knew I didn’t want anything to do with them. I also realized there was something spiritual going on. I suddenly realized that if I were in a foreign country and saw a monument to a false god or an evil dictator in a Christian area, I would think, “Why don’t they take this down? They are Christians now.” Sometimes it’s easier to see things in another culture than in our own. I understand what you’re saying about the hands-on type of learning that happens through monuments and museums, and I agree wholeheartedly. I’m not suggesting that they be destroyed, but rather that they be relocated to historical museums where educational materials can be supplied that address not only the sacrifice of Confederate soldiers and citizens, but also the horrors of slavery. If you’re central argument is “Idolatry”, then this would also apply to Martin Luther King statues, Mount Rushmore, Jesus statues, Mother Mary statues and countless others. Even our government and society in general is idolatrous..i.e. from money and careers to name a few. Not to mention, Idolatry is in the heart, not the object itself and only God knows and makes the final judgement about what’s in ones heart. 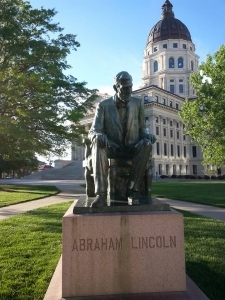 Personally, I don’t look upon a statue with idolatry–I see it as a piece of history worth discussing. If that makes me “less” of a Christian, well I’ll just leave it to Christ to judge me. The article is more about our willingness as Christ-followers to remove obstacles that stand in the way of someone’s coming to the Lord. If we are unwilling to allow the removal of statues that are honoring the fight for slavery—knowing full-well that their presence (and our defense of their presence) is actually turning people AWAY from Christ—then we need to check our hearts and see what the real problem is. Scripture is clear about this, and we should never prioritize the preservation of a statue of wood, clay, stone, or metal over the salvation of someone’s soul. They’re just statues.